Advances made in electric forklift technology over the past decade have made them a better solution for a growing number of material handling requirements. Not only is an electric forklift a better solution, but with the significant cost increase in fossil fuels, they now have a better return on investment over a five year period than IC trucks. 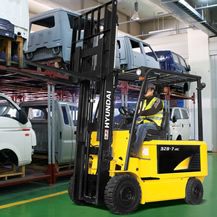 Hyundai offers a wide range of electric forklifts including Orderpickers, Narrow Aisle Reach Trucks, Three Wheelers, Cushion and Pneumatic Tire electrics. 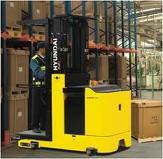 Hyundai even offers a high amperage pneumatics that can go anywhere a gas forklift can go. Should you own an electric forklift? The better question is can you afford not to. Use our cost analysis tools to prove it to yourself and your company.